Cutscene Aspect Ratio - please help! First off, I've got a 21:9 ultrawide monitor (2560x1080 max native resolution). Normally, I'd run the game in 2560x1080 but my video card is mega trash so I thought reducing the resolution would be a great way to gain FPS. 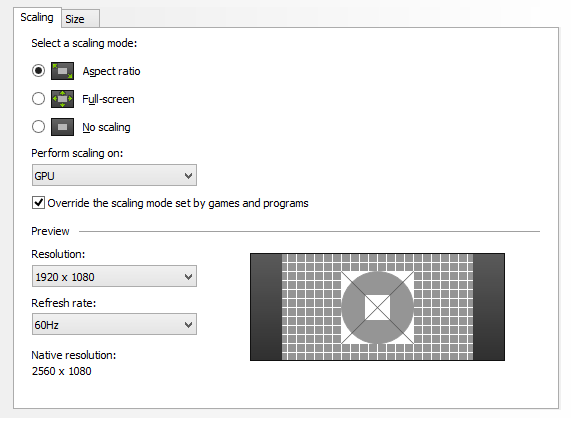 So I adjusted NVIDIA Control Panel settings in such a manner that it optimizes games for 16:9 instead 21:9. It does work when I change the in-game resolution to 1920x1080 and the aspect ratio to 16:9. While in-game, I see two black bars on the side and it's all correct. Please someone help, I'm sick of this!